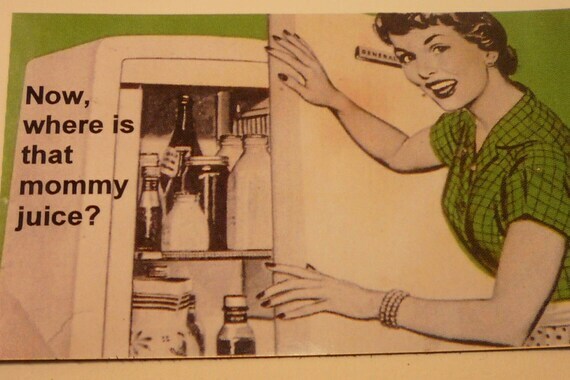 Yes, I said it, I'm in Housewife Hell! I weighed in for a weight loss challenge last Thursday & now I just want to eat everything in sight. This is driving me to want "Mommy Juice" at 9:30am! We often confuse thirst with hunger, leading to load our body with unnecessary calories, when what we really need is a glass of cold water. If you prefer, you can add some lemon slices to the jug of water for extra flavor, or to drink tea with fruit flavor, but no sugar. It is a simple and healthy trick that will help you a lot in your weight loss efforts. Set a goal to try and consume the recommended 5-9 servings of fruits and vegetables per day. This will ensure that your body takes the necessary fiber, while fighting hunger. You must also not forget the many benefits of veggies for your health and disease prevention. A good way to eat more vegetables is to mix them with the food. For example you can have vegetables in your rice or soups, in chicken as salads or in pasta. This is better than eating them on the side. Eating more vegetables is a healthy habit that once you get used to it you will never want to quit. Besides they are ZERO WW points people. Many times, our desire for food is not due to real hunger, but due to other several psychological factors. Hunger is the message of our organism to tell us that we need fuel, so if the desire for food is not due to hunger, the food will not make us feel better. On the contrary we will feel worse because of the extra unnecessary calories we will consume. It is also a not healthy habit because it does not offer anything and will help you destroy your weight loss efforts. Try to reduce the portions of your meals and increase their frequency. Notice after each meal if you feel bloated or tired so you understand when you feel real hunger & when you eat because you are "emo". The most dangerous time to destroy your weight loss efforts and diet is after the last meal of the day, when you lie down in front of the TV with a bag of chips, gallon of ice cream or bag of Halloween candy. This is the time that you eat out of a habit, without really being hungry. To completely avoid your favorite food will not create the desired results since the feeling of deprivation leads at sometime to exaggeration. Think the last time you did not eat chocolate for a month and the quantity consumed when you decided that you are ‘allowed’ to eat chocolate. Instead of excluding from your weight loss program and diet foods you really enjoy, be sure to buy them in smaller amounts and to eat them less often, once or twice a week. Moreover, the expectation is what makes the satisfaction greatest. Ya, ok, still working on this one. I do love the mini reese's out this time of year. When you need to exit your diet for a while, add walking into your routine & avoid the drive-thru's. For even better results, do not buy sweets or other snacks for home- instead replace them with plenty of fruits and limit your night outs to one per week. Hopefully, you will not have to worry that you will give up to the temptation while you are at home. The weight loss is achieved by the consumption of fewer calories than those we burn. When, however, we are constantly hungry, this is not easy at all. Research shows that people who eat 4-5 meals a day find it easier to control their appetite and weight. Add seasonings or hot spices in your food, which will enhance the taste and make you feel that you eat more. The meals enhanced by tasty spices will stimulate your taste and create a sense of satisfaction, without actually eating more. When you want something sweet, choose a hot flavor with cinnamon or ginger. It gives you the sweet flavor you need, with fewer calories. The easy-made meals or snacks that are prepared quickly solve a lot of your problems (cooking time, preparation time etc) and lead you a step closer to weight loss success. These will prevent you from ordering something from a fast food restaurant or to order pizza, because you can within 5-10 minutes prepare your own healthy meal. This one tip has saved me many, many times! TIP #10. ORDER KIDS MEAL! When eating out, you can order an individual pizza or a small sandwich. In this way you keep the calories low and the quantity consumed controlled. Another trick is to use smaller plates. This helps the portions look larger, and if by looking at them you mind is satisfied, then most likely your stomach will also be satisfied. Happy Eating?! I mean seriously, who can't be happy with a kid's meal? You get the latest Hello Kitty toy with your meal. be in good order well-read earlier you buy from mass in suit someone other and make numbered lists to union. Visitors to your place becomes writer credulous and instrument support you search your beat out. and get the freshest and touristy steel online.